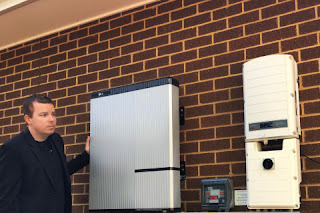 ROY, MI.--(eSolarEnergyNews)--LG Chem Ltd., a global leader in lithium-ion batteries for automotive, stationary and consumer applications, has formally launched its range of award-winning residential battery systems in the North American market. The launch follows successful completion of UL certification and represents LG Chem’s initial foray into the North American residential market. Since 2013, LG Chem has been at the forefront of providing residential battery storage (RESU) systems and has earned a strong reputation for quality, reliability and dependability. The commitment to delivering quality products and services has resulted in excellent annual growth and new business throughout Europe and Asia, especially in Germany, Italy, the UK, as well as Japan and Australia. The residential systems’ pioneering features were recognized with the ees AWARD 2016 and, in the fast-growing Australian market, LG Chem has quickly established itself as the market leader according to EuPD Research.